The transformation of a dilapidated Brigantium roundhouse site in Northumberland into a star attraction and centre for village activities has been unveiled to the public. The development at Rochester, by students from Newcastle University’s School of Architecture, Planning and Landscape, was completed just in time for Redefest, where an official unveiling took place. 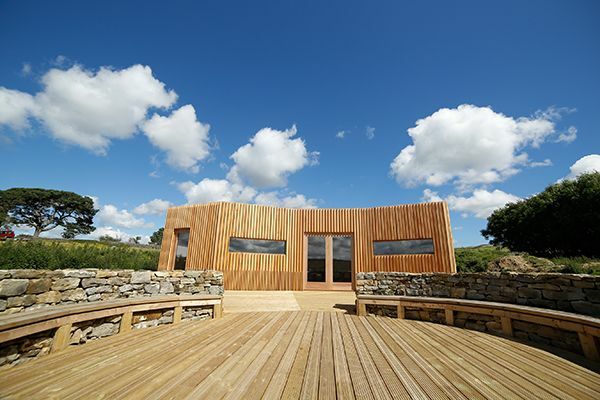 The students worked in partnership with Kielder Water & Forest Park Development Trust’s Art & Architecture programme and the local community in Rochester, designing and constructing an open air amphitheatre and contemporary timber pavilion to be used for stargazing, musical performances, and a range of community workshops. Redeveloping the roundhouse was the latest part of an ongoing collaboration between the School of Architecture and the Development Trust to create public facing architectural commissions and activities. Past work has included constructing a Stargazing Pavilion at Stonehaugh in 2014, and The Warm Room on Kielder’s community campsite in 2015. Graham Farmer, Newcastle University’s Director of Architecture said: “This is the School’s third major design-build project in Northumberland and this has probably been the most ambitious so far. The students have demonstrated real commitment and enthusiasm, working through all weathers to ensure a successful completion. “The opportunity to work collaboratively with the community at Rochester and a range of organisations has been an invaluable experience for all the staff and students involved. The Rochester community were an active partner in the work, identifying community requirements, approving designs and getting involved in the construction, with local craftsmen supporting the project. Red Kellie, Vice Chair of Rochester Village Hall, said: “This project is one of true collaboration, bringing the community together with many other parties, including students from around the world, to create something very unique for the people of Rochester and visitors from further afield. We are very grateful to all who have taken part in the creation of this fabulous new roundhouse." Support from the project has come from a range of organisations. The Newcastle University Students' Union (NUSU) Go Volunteer scheme funded the drystone walling training and sessions, students' expenses and use of its people carrier. Alongside students from the UK, volunteers from Malaysia, Oman, the UAE, China, Germany and Canada took part in the project. Other support from partners included Northumberland National Park Authority funding the sedum roof, money from County Councillor John Riddle through the Member's Local Improvement Scheme for the decking and disabled access ramp, and funding from Northumberland County Council's Community Chest, which covered groundworks, fencing, windows and stargazing equipment. Funding and support also came from Arts Council England, Lord Redesdale, Redefest, and the Sir James Knott Trust. Peter Sharpe, Kielder Art & Architecture curator, said: “Bringing everyone together in this way to create something wonderful for the community and for visitors to the area is a fantastic achievement. We are blessed with the darkest skies in Britain and structures such as this help us to enjoy and celebrate them. “We worked with the local community to find a way to take the original structure of the roundhouse from a state of disrepair and enhance it in a unique way that the village can use. Having students from across the world, organised through NUSU's Go Volunteer scheme, made it extra special."